Data science is an occupational path that has drawn a wave of attention and excitement from the business and technology communities over the past several years. The mounting demand for the unique skill set exhibited by information-technology data scientists led Harvard Business Review to declare it the sexiest job of the 21st century. According to HBR, these individuals bring together qualities usually associated with data analysts, hackers, communications specialists and business advisers. Today, many corporations, consulting firms and scientific research organizations rely upon the advanced abilities and expertise of data scientists. Since this career calls for such a versatile range of deep technical knowledge, advanced education is a necessity. If you’re considering business analytics master’s programs, a future as a big-data guru could be within reach. Data science has its roots in a combination of statistics and computer science, so practitioners have a lot in common with both data analysts and statisticians. However, these individuals stand apart from other experts in IT and business analytics by working with quantitative information of greater depth and scope for a broader set of applications. The position calls for using methodologies and technologies from multiple disciplines, adapting them to solve real-world problems and make accurate predictions. Every day, organizations are taking advantage of web-analytics tools, cloud storage and machine-learning algorithms to learn more about customer demands, industry trends and security risks. Data experts put businesses in touch with the possibilities of that information by taking on a wide range of tasks that involve digging into raw data to yield greater meaning. Depending on the industry an IT data scientist works in and the size of a company’s data-analysis team, the responsibilities of the job can greatly vary. These highly skilled experts often have advanced understandings of mathematics and computer programming that allow them to make connections others cannot. Drawing on that background, they turn data into the business intelligence that informs immediate decision-making and readies organizations to build strategies for the future. The high expectations placed on data scientists mean that obtaining and succeeding in a position requires extensive training. Meeting the challenges of this job takes someone who is well versed in and passionate about the complexities of wrangling, interpreting and presenting quantitative information. Given the multidisciplinary nature of the work, individuals have taken a number of different educational and professional tracks to get there. Many experts in data come from a background in software engineering. Others started off studying statistics. Whatever routes they took, all share a solid grounding in the necessary mathematics, programming, analytical techniques and software. Such a knowledgeable foundation begins with a thorough understanding of the basic skills and tools involved in accumulating, tidying and visualizing data. Anyone who hopes to build a career in data science should be familiar with the database querying language SQL and a statistical programming language, such as Python. You will also need an understanding of essential statistics concepts like hypothesis testing, probability distributions and maximum-likelihood estimation. Machine learning plays a central role in many companies working with data. Individuals who are experienced with algorithmic models like random forest and ensemble averaging are better prepared to take on a position in data science. Multivariable calculus and linear algebra, which are both heavily involved in machine learning, can prove helpful for optimizing these processes and creating new implementations, though readily available tools will perform many of the necessary calculations. Data scientists should be able to catch and correct data imperfections, including missing values and inconsistent string or date formatting. You must know how to encode data in visualizations and communicate that information effectively. Past work in developing data-based software products may also be an advantage, especially in cases where the new hire may be required to create customized tools. Above all, a data scientist must be an individual who can make the necessary connections between massive quantities of information and the problems facing an organization. The challenges these professionals deal with are not purely intellectual exercises or short-term issues. Rather, data science can lead the way, directing the business toward its goals and navigating the most efficient way to get there. The heavy responsibilities and advanced thinking involved in data science require specialized learning. As the tremendous impact of big data in the workplace has become clear, educational institutions have established curricula to meet the demand for individuals trained in data analysis. Earning a master’s in data analytics can set in place the base of knowledge and skills necessary to take on this role. Students in data-analytics master’s programs learn tools and techniques for collecting, managing and analyzing massive sets of quantitative information. Their training prepares them to keep complex systems running efficiently and to draw insights that can have a major impact on the direction of an organization. With this kind of focused, advanced education, it’s possible to find a successful career as a data scientist. Big data has become increasingly vital to how businesses understand their position in the market and plan for the future. The right information can guide innovative technological development, smart investment and improved practices for serving consumers. Decision-makers have therefore realized the urgency of hiring and retaining individuals who are able to manipulate the relevant numbers and draw actionable conclusions. Glassdoor ranks data-science positions as the best jobs in the US, based on the median salary, overall job satisfaction and the high rate of unfilled positions. The large number of openings for relatively few qualified individuals means many of the people who are hired are well compensated and tend to enjoy a great deal of flexibility. The near-instant transfer of data and massive capacity of cloud storage have brought new possibilities for businesses of all kinds. Finding order and meaning in the enormous volume of relevant information takes professionals equally capable of programming, mathematical problem-solving and the soft skills of business communications. Data scientists are now an essential part of any organization focused on charting its way with thinking that is complex, analytical and quantitatively driven. Having experts in big data on the job leads to faster, better-informed strategy and decision-making. These professionals make the businesses where they work function smarter and more efficiently. 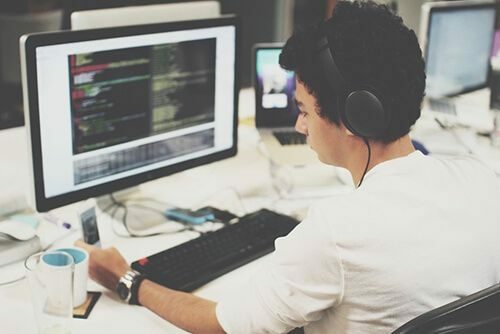 With an education focused on big-data analysis, visualization and communication, it’s possible to build a fruitful career as an IT data scientist. Working toward a master’s of science in analytics degree is an excellent way to get the kind of skills and credentials necessary to make that career a reality. If you’re interested in becoming one of the leading minds in the analytics arena, consider a top-ranked program such as Villanova’s online Master of Science in Analytics. 1. What program most interests you? What program most interests you?